A New York based ensemble, Duo Vivace grew out of four-hand collaborations by Susan Sobolewski and Eleonor Bindman, who were students of Vladimir Feltsman and frequent performers in his master classes at SUNY—The College at New Paltz. Duo Vivace inaugurated its performing career with a four-hand recital debut at Carnegie (Weill) Recital Hall in New York City in 1993. The duo has since performed and presented master classes at such venues as Barnard College, Westminster Choir College, Ithaca College, Nassau Community College, Ramapo College, the Kleinert-James Gallery, Rutgers University, Merkin Hall and Steinway Hall. The duo has also been guest artists at summer festivals such as the Piano Institute at SUNY New Paltz, the Palisades Arts Festival, the Festival of Performances (Bethlehem, PA), and Music in the Mountains. 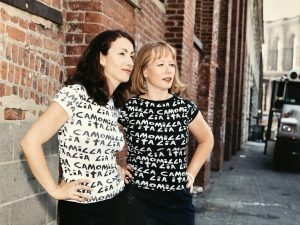 In 1995, after its critically acclaimed New York two-piano debut, Duo Vivace was invited to perform at the First International Duo-Piano Festival in Quebec, Canada. More recent performances include a live radio appearance on WAMC in Albany and the world premiere of the four-hand version of Robert Starer’s Concerto for Two Pianos with the Hudson Valley Philharmonic under the baton of Jo Ann Falletta. With the recording of Out of the Blue, Duo Vivace celebrated its tenth anniversary of musical merry-making!